Alberta Health has mandated that all Health Care Aides (HCAs) working for a publicly funded employer enrol in the Alberta HCA Directory. having a one-stop location to get HCA information, news, educational opportunities and updates. This includes course offerings for skills development, education and training, and job links. A graduate of a recognized Alberta educational institution, are living in Alberta, and currently not working as a HCA. 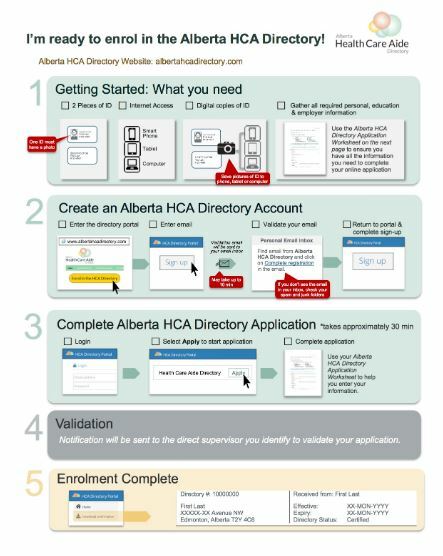 Review the Alberta HCA Directory Enrolment Guide and Checklist for more information and directions on how to enrol. How do I know if I qualify as an HCA in Alberta? The following are the core competencies as outlined in the Continuing Care Health Service Standards, 2018. When applying as a HCA on this Directory you will fall under one of these core competency statuses. Certified: HCA education obtained through a Government of Alberta licensed post-secondary institution (using the provincial HCA curriculum). What information will the Directory collect about me? Personal and Demographic information: name, address, email address, gender, age and contact information. After the first year, HCAs will need to provide official transcripts to the HCA Directory, therefore ensuring that HCAs enrolled on the directory have the required education. What kind of information will be provided to current employers? The HCA Directory will act as an information database giving employers the opportunity to learn about the HCA role and status of attainment of core competencies. Note that employers can only see their HCA employees; no other HCAs in Alberta. 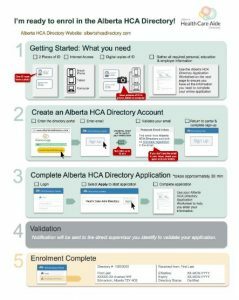 For more information about the Alberta HCA Directory please check the Frequently Asked Questions.